Paramount and Freeverse's latest collaboration puts you in the cockpit of a fighter jet. Top Gun for the iPhone takes place several years after the events of the movie. Iceman and Maverick are now instructors at the Top Gun fighter pilot school. You play as a hotshot trainee who, over the course of ten missions, becomes an accomplished fighter pilot in his own right. The cut scenes that move along the plot are rendered in a cartoon style reminiscent of the old Nintendo version. Seeing familiar faces throughout the story, hearing the adrenaline-pumping theme song, and once again engaging in dogfights should reawaken fond memories for anyone who saw the original release. Brian Akaka, the marketing director for Freeverse, explains that the developers wanted to create a game that is a respectful of the original content but moves the game in new directions. The original Nintendo version of Top Gun was infamous for the difficulty of landing the plane after a mission; so landing in Freeverse’s iPhone version is automatic. Fans of the original game will also appreciate the necessity of dodging missiles while using your own sidewinders and Vulcan cannons to pick off bogeys. The demo presented a canyon run mission (a reference to Star Wars) and a level where you must protect an American aircraft carrier from attack by Russian MiGs. The F-22 Raptor you pilot is rendered with great detail and the environments aren’t just colorful backgrounds (a la Iron Man) — instead showing a surprising level of detail. Your flight path is on rails, but you still must use the iPhone’s motion sensor to tilt your iPhone and maneuver your plane around the screen to avoid obstacles and incoming missiles. 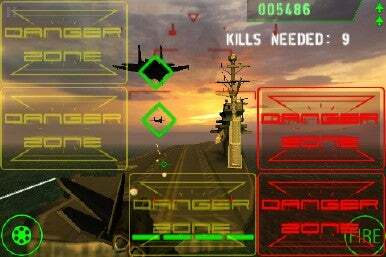 The screen flashes “Danger Zone” (a reference to the iconic song by Kenny Loggins made famous by the movie and sadly absent in the game’s soundtrack) whenever there is an obstacle you must avoid. Doing a flight simulator for the iPhone presents some unique challenges. Balancing combat, flight, and producing a compelling interface may still be beyond the reach of many developers. Yet, while arcade games with rails navigation are a thing of the past, Top Gun may represent one of the few enterprises where that’s OK. The nostalgic moments, exciting combat, and high graphics may overshadow the navigational limitations of the game and instead be an asset to the game’s “retro” feel. Look for Top Gun in the App Store this spring.